Keith and I are survivor fans. Every Survivor night I sneak out of work a bit early to be home in time to watch it together. It’s our weekly date night. So as this season came to an end this week, I realized that it would be our last Survivor Finale Show. We won’t be here for the next full season (and we won’t have a tv onboard). For a few minutes I was kinda sad. Then, DUH!! We won’t be here to watch someone else have the adventure of their lifetime because we will be out living our our very own version of Survivor. We will find our own private beaches to explore and reefs to snorkel. There will be new friends to meet and alliances to make. Obscure clues to decipher (I am thinking weather forecasts here). Plenty of rice and bean dinners -and fish, lots of fish (why did they never figure out how to fish for the entire last season?!) There will be challenges with spectacular rewards, this I am certain. But, hopefully, there will be no eliminations in our version. 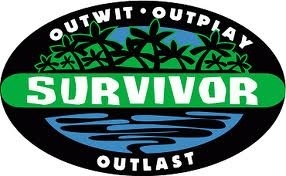 Now, only if we can keep our adventure alive for as many seasons as the real Survivor. Definitely! Could not imagine better teammates!